RAPID CITY, S.D. 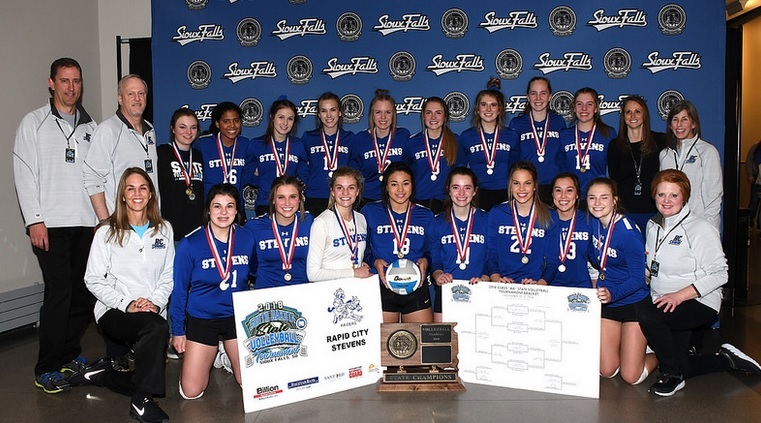 - The Rapid City Stevens Raiders Volleyball team capped off a nearly perfect state tournament, winning the championship in three straight sets over Sioux Falls Washington Saturday night. Stevens had only dropped one set the entire tournament heading into the championship, and by the time they were done, that set remained the only loss the Raiders would record. Washington started strong, but fell 25-22 in set one. Stevens powered past Washington in the second set 25-18. And in the third set, Washington just didn't have enough to fend off a brutal Stevens attack, and the Raiders pulled off the sweep 25-22. Laura Petik helped lead the Raiders with 17 digs. Phebie Rossi added 11 kills for Rapid City Stevens.